Ilkka Niiniluoto, a distinguished philosopher of science, has been a tireless spokesman for scientific realism and reason more generally. Trained in the tradition of the Finnish school of inductive logic he has refined the notion of truthlikeness (verisimilitude) to make the realist idea scientific progress mathematically exact. Niiniluoto´s main technical works are included in his books Is Science Progressive? (1984) and Truthlikeness (1987), but his most recent general defense of scientific realism culminated in his Critical Scientific Realism (1999). Niiniluoto is, since 1981, Professor of Theoretical Philosophy at the University of Helsinki, and since 2003 the Rector of the University. He has for a long time been one of the most prominent public intellectuals in Finland. This Festschrift brings about a selection of philosophical essays on Niiniluoto´s philosophy by prominent member of the international community. The contributions are grouped around three themes. The first ones deal with philosophy of logic, the philosophy of language, and the philosophy of mathematics, and the second group consists of papers on induction, truthlikeness, and scientific progress. The third part collects essays on the history of logical empiricism, the ontology of social groups, and the dispute between theism and atheism. 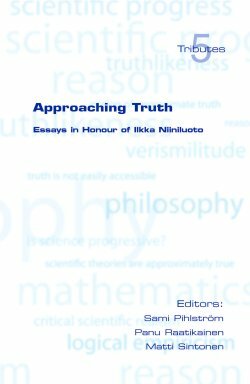 This book is a tribute to Ilkka Niiniluoto on his 60th birthday, and it also contains Niiniluoto's replies to comments, queries and criticisms.